I Love You More Than Carrots: MerryChristmasHappyNewYear, Don't Worry, I'll Be Back! MerryChristmasHappyNewYear, Don't Worry, I'll Be Back! As we all know, the Christmas season brings with it a teensy bit of chaos. As much as I love and believe it or not, thrive on a little bit chaos in my life, I recently realized that I need to take a step back and truly enjoy the days leading up to one of my most favorite holidays of the entire year. I did say a little bit of chaos in my life, so nobody get any ideas! During the next few weeks, I'm looking forward to carefully wrapping each and every one of the presents that I thoughtfully spent the last year hand picking for each of my family and friends. I actually keep a running list throughout the year and as soon as somebody mentions something they've seen and loved or coveted, it immediately goes on that list for birthdays and holidays. And not only do I carefully hand pick the presents, but the wrapping paper as well! Of course, everybody's wrapping paper is different.. and needless to say, it requires matching accoutrements in the form of ribbons, tissue, tags and bows! I can't wait to spend the small bit of free time that I find myself with, each night after work, baking lots and lots of yummy Christmas cookies. Don't worry, I'll be sure to keep the baking soda far away from the confectioner's sugar! I'm looking forward to preparing myself each week to take part in my Church's Sunday morning Advent Mass. The cathedral where we attend Mass each week is just breathtakingly beautiful in the wintertime and I love seeing it decorated with endless yards of garland and mounds of pointsettias! Not to mentin, I just love hearing the organ piping Christmas music throughout the marble halls! Blogging has become such an important part of my life this past year (Can you believe I will have been blogging for ONE WHOLE YEAR December 13th?) and I have a few scheduled holiday re-posts that you will see in the coming days. I'll also be hosting a post-holiday happy-blogiversary-to-me giveaway in 2010! Please don't forget about me, I promise to keep reading all of your blogs that I possibly couldn't get through my day without reading! I promise I will be back after the New Year! Wishing each and every one of you a blessed holiday season and the happiest of New Year's! Cute picture. I tend to thrive in the chaos too...time for relaxing! Merry Christmas, Happy New Year and Happy Blogiversary! merry christmas, happy new year, and happy bloggie birthday to you! Enjoy your time and Happy Blogiversary, Merry Christmas and Happy New Year! I will miss you, friend! is cakebread really your favorite Chard? BECAUSE it is my fav too!!! Enjoy the holiday season and all of your Christmas traditions! Have a Merry Christmas and a good break! Merry Christmas!! Don't stay gone too long but have a great break!!! But...but...but...I am going to miss you!!!! Definitely take time to enjoy the season. Hope it is a very wonderful one :) See you when you get back! 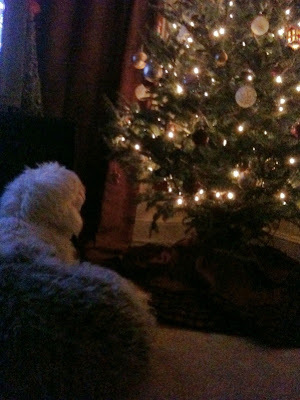 ....is sully looking for santa?!? :( will miss you....Merry Christmas and have a beautiful celebration! I hope you have a very Merry Christmas and a Fabulous New Year! have a great christmas and a happy new year! enjoy it!! we'll be here when you get back!! although, i'm really going to miss your stories while you're gone! what will i do with no sheepie laughs?! I know exactly what you mean about enjoying it and just taking time to appreciate things. It can really feel like it is all running away from you so easily. Love your blog :) Have a wonderful holiday! I hope your holidays are completely wonderful! Enjoy every moment!